Jun 26, 2015 . . .
Everyone adores beauties and likes watching beautiful people and faces. There is no doubt that beauty comes with some significant advantages in human society. For instance, you can see the amount of attention and money that flows to the most attractive models and actresses. Therefore, a lot of people try to be beautiful by dressing nicely, wearing make up, doing exercise and being fit and skinny. The definition of beauty depends on culture and society. In other words, the general concept of beauty is universal, but some aspects of beauty could be different in different societies and cultures. It is obvious that women are more willing to take care of their appearance compared to men. As you can see there are more fashion blogs and shops and cosmetics for women. Women can make their hair or wear makeup and wear a nice dress to look prettier, but the situation in Iran is different. According to the implementation of Islamic law in Iran after 1979, hijab in the country is compulsory for women, which means women regardless to their religion and nationalities, have to cover their whole body except face and hands in public. Iranian females, same as other women in the globe, like to be stylish and attractive. They wear colourful headscarf or shawl with a stylish long coat or button up blouse which called “manteau”. But these seems not enough to display the beauty of Iranian women. As it mentioned, women in Iran are allowed only to display their face, so all their attempt would concentrate on the beauty of their face. The number of usage of cosmetics is high in the country. Reports show that Iran is one the biggest consumers of cosmetics. Because of the high demand of makeup products in Iran, the country has become a great destination of counterfeit cosmetics. The analysts of Iran’s market shows that the annual market value of cosmetics is around $2 billion, and the makeup consumers is about one third of total cosmetics consumers in the Middle East. Moreover, Iran has the largest rate of nose surgeries in the world. 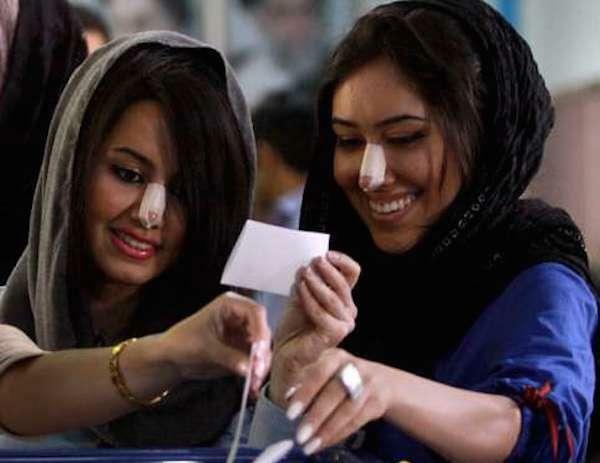 Reports indicates that “Iranians get four times the amount of nose jobs that Americans do”. The popularity of nose surgery has increased and permeated the culture. Nose surgery is not limited to the rich and wealthy people in Iran. Many Iranians including university students, office workers, state employees, teenagers and others tend to spend their savings or go into debt for the surgery. According to the Rhinology Research Society of Iran, “More than 80,000 cosmetic nose surgeries are performed in the country annually”. It is obvious that the procedure has become a social trend for the young generation, but still some young Iranian females oppose it. They recently have created a campaign on Facebook called “My Natural Nose” where people can share photos of their natural nose. More than 330 women have shared their pictures on the page. Maryam, the founder of the page says “We believe that we must respect different faces and we must not humiliate anybody because her face does not conform to “standards”. In this way, we are trying to help to expand the space for real decision-making by people, including decisions about how they look”. This article has been published on The News Hub.